Eggs Benedict is always my go to brunch choice when dining out. I am absolutely obsessed with it, and I love all the different varieties out there! Seriously…soooooo many good ones. Occasionally, I’ll make it at home for myself, and when I do, I use my homemade hollandaise sauce which helps to save a ton of extra fat and calories. 1. Fill a small sauce pan with water and bring to a boil. The size of the saucepan and the size of the eggs will determine how much water you should use. You need at least a couple of inches of water in your saucepan for the poached eggs to turn out right. 2. Once the water has come to a boil, bring the heat down to a simmer. Now add 1 tablespoon of vinegar to the water. 3. Bring the cup with your egg as close to the water as possible and gently pour the egg into the simmering water. If you are using more than one egg you will want to wait at least 30 seconds for the egg to begin to set before adding a second one to the saucepan. This will help keep eggs from clumping together. 4. Allow the egg to cook for approximately 3 minutes, If the egg starts to break up and spread around the pan, use a slotted spoon to guide it back to the center. When the poached egg reaches the desired level of done-ness remove it from the water with a slotted spoon. In an effort to make my eggs benedict even more light and healthy, I created this Portobello Eggs Benedict Recipe that is just 4 Points (including the hollandaise!) and is absolutely delicious. Plus, it’s a great way to get those veggie servings in. Enjoy! A paleo version of my favorite breakfast, this dish is a fantastic bargain at just 4 Smart Points per serving! Get your veggie servings on early in the day with a low fat, high protein breakfast that tastes incredibly decadent. Mist mushroom with non-fat cooking spray and season with salt and pepper. Top each with two slices of the Canadian Style Bacon. Place in oven, and roast until mushroom is tender and bacon is sizzling, about 10-12 minutes. While mushrooms are cooking, heat olive oil in a skillet over medium high. Add in spinach leaves and garlic, and cook until spinach has wilted down. Poach eggs using a poaching pan or by following the instructions in the NOTES below. 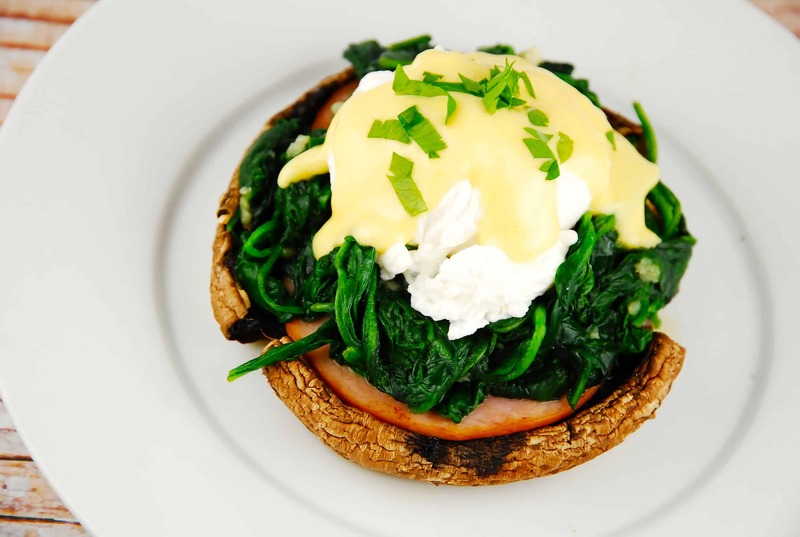 Divide spinach evenly between between both mushrooms, then top each with 1 egg, and 1/8 cup of hollandaise sauce.